The sixth principle that I am committing myself to live by is the realization that who I am in thought, word and deed affects not only myself – but others as well and so with Self Responsibility in thought, word and deed – I take Responsibility for myself and so my relationships to be Self Aware in every moment and live in such a way that is best for me and so others as well. I am creating myself through the words that I think and speak as with these words I define my intentions and actions and so I am responsible for every word that I think, thus I have to align my words and my thoughts with the principle of what is best for all Life. This way I can make sure that I will not abuse myself as Life, but instead create through words what is Best for All Life. I can see how I am still using words, thoughts and actions that divide me and others, that create separation within me and between me and others and how through this I am the one who still participates in the abuse of self as Life and so all Life. I can see this in the feelings and emotions that I create with words and then live out. I can see this in my thoughts of spite and anger, in thoughts of blame, judgment and fear. I can self-honestly see this in my words, thoughts, habits and actions, where I have still not taken full self-responsibility for who I am and what I stand for. And so, because I am still not in all ways standing as the principle "do not do onto others as you would not want to be done onto you", I commit myself to continuously walk the process of self-honesty, self-forgiveness and self-corrective application where I will align myself to the principle of what is Best for All Life, so that I will stand as a practical example of how we can all co-exist and co-create in a way that is Best for All. I take self-responsibility for all my thoughts by observing myself self-honestly in every breath and then write down the mind patterns that I observe that come up within me throughout the day. This way I see and can realize how I have created my various mind patterns and consequently, how I am creating the emotions and feelings within my body. After I see the pattern, I apply the principle of self-forgiveness, where I remove the bond that I have created towards the specific mind pattern that I am forgiving myself for and so I free myself from it in a way where I can then decide what exactly do I want to live instead of that pattern and I make sure that who I am within the new pattern that I am creating is what is best for All Life and so best for myself as Life. I do this through writing my blogs and doing my DIP assignments, where I work with my buddies that help me realize the patterns that I am participating in, so that I can be more effective in my process and so I also help others to see their own patterns and help them as I would like to be helped and together we align ourselves with Life and what is Best for All. 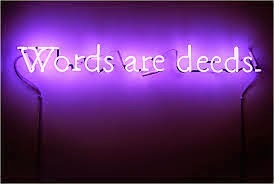 I take self-responsibility for the words I think, speak and live by looking at how I have defined the words. I self-honestly see if I have any emotional reactions towards specific words and then I remove these reactions through self-forgiveness. Then I look at how I have defined the specific word and check if the definition helps me to live the word in a way that is Best for All. If this is not so, then I re-define the word in a way that is supportive for me and all, so that I can start using and living the word in a way where I will not create abuse, separation or harm, but only what is Best for All. I take self-responsibility for the deeds and actions I do and participate in by observing myself in self-honesty in every breath and making a note for myself every time where I see that I am not acting in a way that is Best for All. Then I look at my thoughts and words that I used in my mind to plan and justify my deeds and so by taking self-responsibility for my words and thoughts, I change myself and realign myself, my deeds and actions, to what is Best for All in Oneness and Equality.